A basic tenet of surgery is to effectively treat pathologywith minimal disturbance of normal anatomy: leaving "the smallest footprint." This is being accomplished more effectively by designing procedures that require smaller incisions, result in less soft-tissue disruption, and involve limited surgical corridors. The development of these procedures has been implemented through technological advances in illumination, magnification, and instrumentation. Most surgical specialties have embraced this minimalist concept, particularly general surgery, with a dramatic rise in the numbers of laparoscopic cholycystectomies. Spine surgery is also gaining momentum in this regard, although some reports suggest that the limited exposure that results from these techniques can result in incomplete treatment of pathology with no clear-cut advantage over traditional techniques. The avoidance of complications is more challenging through limited surgical portals. Recurrence and reoperation rates can increase, especially in the realm of lumbar disc surgery. In spite of these challenges, the evolution of minimal access spine technique (MAST) has exceeded that of traditional spine procedures over the past 2 decades (Fig. 1). This began with Yasargil's adaptation of the operating microscope to lumbar discectomy in 1967. With the advent of managed care, the diagnostic related group (DRG) system, and efforts to return patients to work more quickly, there has been pressure to perform spine procedures on an outpatient basis or with very short hospital stays. Spine center models developed and frequently use these techniques in their efforts to deliver a higher level of care efficiently. Additionally, telemedicine and the availability of Internet access to the medical consumer have increased the public demand for these procedures. Consequently, more spine surgeons are seeking training and proficiency in these techniques. The purpose of this article is to document the history, present status, controversies, and future trends in minimally invasive spine surgery and its associated technologies. Discussion will be limited to disc pathology and degenerative and traumatic disorders in the various regions of the spinal column. Fig. 1. 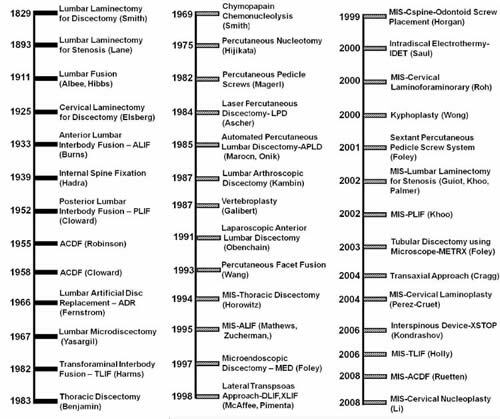 Chronological timelines showing technical and procedural milestones in spine surgery using traditional techniques (first column) and MAST (second and third columns). Historical reviews document that the first laminectomy was performed in the US for traumatic disc rupture in 1829 by A. G. Smith. Oppenheim and Krause reported successful removal of a ruptured disc as early as 1909. The first unilateral laminectomy was performed in cadavers by Taylor. Mixter and Barr are credited with our earliest understanding of lumbar disc disease in 1934. One of the earliest milestones in the development of minimally invasive spine surgery and, in particular, lumbar disc surgery, dates back to 1941 with the discovery of chymopapain. Jansen and Balls discovered that properties of the Carica papaya fruit could cause depolymerization of the proteoglycan and glycoprotein macromolecules in the nucleus pulposus. Smith adapted these laboratory concepts to the clinical setting and performed the first chemonucleolysis procedures in humans in 1969, and this is considered to be the first minimally invasive spine procedure. It involved a needle technology whereby the chemical chymopapain was injected into the annulus to remove the herniated disc by enzymatic hydrolysis. In spite of its eventual approval by the FDA, enthusiasm for this procedure has dwindled, as several reports of arachnoiditis and other associated complications were published. Descriptions of a 3 to 4 month history of low-back pain from chemical discitis were not uncommon in the postoperative course of these patients. In 1975 the first percutaneous nucleotomy technique was reported by Hijikata. Open lumbar microdiscectomy was popularized 3 years later by Williams with his technological advances that allowed soft-tissue retraction through a small surgical corridor. Laser-assisted percutaneous discectomy was first reported in 1984, and the nucleotome was developed in animal models by Onik and colleagues. Principles of its mechanism involved rhythmic irrigation, pulsation, aspiration and cutting to retrieve the disc from inside the annulus. Kambin is credited with the first percutaneous lumbar discectomy and this was assisted by fluoroscopy in 1987. Maroon, in 1987, first reported the clinical use of the nucleotome in a procedure called automated percutaneous lumbar discectomy (APLD). Many of these procedures were indicated only for contained disc pathology rather than disc extrusions, sequestrations, or spondylotic nerve root compression. The efficacy of many of these techniques compared with standard disc removal still remains in question. Tubular access to the lumbar disc was first reported by Faubert and Caspart in 1991 and this led to the way for development of tubular retractor systems and low profile instruments. The first report of the microendoscopic discectomy (MED) procedure came from Foley and Smith in 1997. The learning curve for these techniques was steep with significant unintended durotomy rates, which limited their initial popularity. Nevertheless, orthopedic spine surgeons quickly embraced these techniques due to their greater familiarity with the arthroscope in joint surgery. However, with the adaptation of the microscope to the use of tubular retractors in 2003, the METRx system (Medtronic, Inc.), more neurosurgeons implemented these techniques. The theory behind these procedures is to lessen the pain and morbidity of disc access by effectively sparing the muscles. With fluoroscopic assistance, the paraspinal muscles directly in line with the disc space on the symptomatic side are sequentially dilated-rather than being dissected and denuded off the lamina. Once this is done, a tubular retractor is placed over the dilators. The dilators are removed and the microscope is directed to visualize the lamina and interspace to allow bone and subsequent disc removal with minimal muscular trauma. Tubular retractors can also be directed over the dorsolateral aspects of the posterior elements, and with aid of the microscope this can be a very effective surgical option for far-lateral disc herniation when compared with the traditional open intermuscular or facetectomy approaches. A more recent technological development in MAST procedures for the treatment of lumbar disc pathology is intradiscal electrothermy (IDET). This technique was introduced in 2000 by Saal and Saal. The popularity of IDET was limited due to lack of clinical trials and long-term outcome data. This created an environment where very few carriers allowed preauthorization for its use, thereby eliminating reimbursement for IDET. 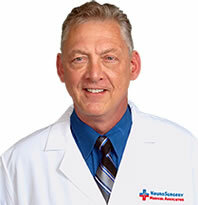 Dr. Jeffrey H. Oppenheimer is an actively-practicing board-certified Neurosurgeon with 27 years of experience. He founded and presently practices at Neurosurgery Medical Associates in Coral Springs, Florida. Dr. Oppenheimer is also on the faculty at the University of Central Florida College of Medicine, and holds medical licenses in several states. Dr. Oppenheimer is a seasoned expert witness with significant testifying experience. He has provided expert consultation for both plaintiff and defense in a variety of cases, including personal injury, medical malpractice (standard of care and causation), and worker's compensation (IMEs).